Dwarka Expressway (a k a Northern Peripheral Road) is perhaps the most important area in NCR from the perspective of real estate and infrastructural development. Yet most of the information available about it on the Internet is 3 years out of date. And 3 years is a long time in real estate. Dwarka Expressway connects Gurgaon to Dwarka. It is the third direct connection between Delhi and Gurgaon (after NH8 and Mehrauli-Gurgaon Road), and many real estate projects have come up in this area. This is true. Many people also think that there are major problems in completing the road because of right-of-way and land acquisition issues. Sectors 81 to 115 have been developed along its length, with particular sectors earmarked for residential projects and commercial projects and public utilities. The best builders of the country all have projects under development on Dwarka Expressway. There are more than 100 residential projects under construction in the area, and the number of residences coming up is estimated to be over 42,000. More than half of these (22,000 apartments) have already been purchased by investors and future residents. The balance 20,000 includes apartments available for sale as well as apartments in projects yet to be launched. 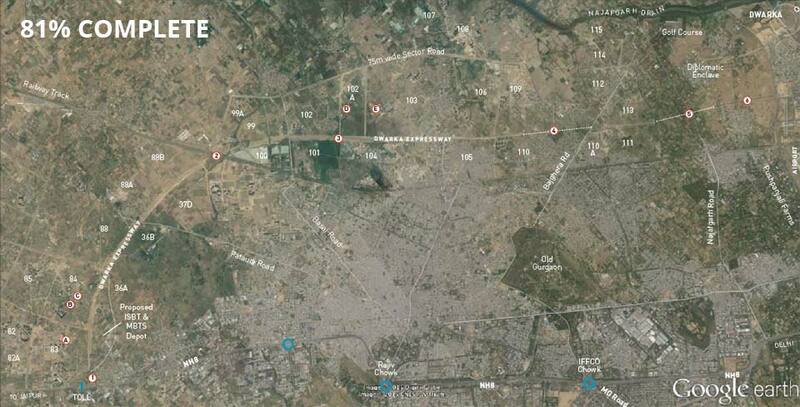 The area around Dwarka Expressway is being developed with strict adherence to the Gurgaon-Manesar Masterplan 2031. This means the final number of apartments is already known, and so the eventual population and number of cars, etc. can easily be estimated. Wide sector roads have been planned accordingly and many of these roads have already been completed. You can drive on them today to get a feel of this well-planned area. So it’s not just a road – the entire area is coming up like a model modern city. Like any model city, it’s not just residences – some of the top names in education, healthcare and hospitality have taken up sites for schools, hospitals and hotels etc. Several of them have actually brought forward their construction plans because of the astonishing speed at which development is taking place in the area. Delhi Public School is opening in Sector 84 and Sector 102A. Construction has begun in Sector 102A and Pre-Nursery to Grade 3 will be ready for the 2015-16 academic year. Modern School Barakhamba Road is starting a school in Sector 91 with a 17-acre campus. MatriKiran Senior School is going to be operational in 2016 in Sector 83. One of PVR’s biggest multiplexes is coming up in Sector 84 in Vatika India Next. 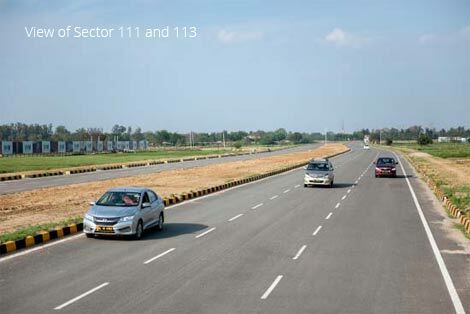 Dwarka Expressway provides the much-needed third link between Gurgaon and New Delhi. But that’s not all – this road has a greater national significance. It is an integral part of the Mumbai-Delhi Industrial Link Corridor. The largest commercial belt of the Gurgaon-Manesar Masterplan 2031 is being built along Dwarka Expressway. As a part of its developmental plans for Gurgaon-Manesar Urban Complex, the Haryana Government has envisaged a Mass Rapid Transit System Corridor (or metro rail) along Dwarka Expressway. This will start at Dwarka and go on towards Manesar and Neemrana via a metro hub that is coming up in a 162-acre plot at Kherki Daula where the new Inter State Bus Terminal is also being built. Thus Northern Periphery Road (NPR) or Dwarka Expressway is much more than just a road with residential projects around it. The project is fully supported by the Haryana state government, and Dwarka Expressway is in fact a shining example of government and private sector co-operation. HUDA is the State Co-ordinating Agency and a number of government departments are actively involved in clearing the way for its early completion. The Implementation Framework has been tendered and allotted to Indiabulls. A lot of the information available on the internet about Dwarka Expressway is outdated and does not reflect current reality. The truth is that Dwarka Expressway isn’t 5 years away. Obstacles are being moved out of the way very quickly and Dwarka Expressway will be here before you know it. Of its 18 km length, 14.5 km have been completed. Only 3.5 km remain, otherwise Dwarka Expressway is ready. You can drive on it today, and see first-hand the rapid rate at which development is taking place in this area. Of the 3.5 km of Dwarka Expressway that remains to be built, only 1.3 km is actually under litigation for compensation. This has held up another 1 km, however is being developed in parts. The construction of a 1.2 km Railway Over Bridge (ROB) is going on and is expected to be completed by the end of 2015. The dispute too is now mostly settled and all issues cleared, apart from some petitioners holding out for better compensation. The matter is sub-judice, so details cannot be revealed. However, it can be mentioned that a settlement is expected quite quickly. Rehabilitation and resettlement of the petitioners is what the courts are considering. They will be rehabilitated in Sectors 110A and 37C – HUDA has over 145 acres of land in these sectors of which only 15 acres will be needed to resettle all the petitioners. This is expected to be completed within 2015. Those interested can refer to the affidavit filed in the High Court at Chandigarh by the Secretary, Department of Town and Country Planning on January 13, 2015. HUDA has already disbursed Rs. 1233 crores to land owners as compensation. Similarly, the factory belonging to Padmavati VNA Mechatronics that was in the path of the carriageway has also been acquired from the company and demolished. Construction at the factory site is proceeding at speed. Construction of the Metro Rail on Northern Peripheral Road (Dwarka Expressway) and Southern Peripheral Road has been approved by the Government and it has been taken up as an early bird project by Delhi-Mumbai Industrial Corridor Development Corporation. The Town And Country Planning Department has determined the Change of Land Use fee for constructing the Metro, and work can commence as soon as this fee is deposited. These funds will be allocated this year, so construction will begin this year as well. Infrastructural development is going on at speed all along the Expressway. In fact, work on sewer lines, electricity cabling and water supply is likely to be completed within 2015. 626 hectares of land has been kept aside for public utilities in Sector 37D, 99A, 100, 101 and 107. Electricity lines are being laid down, and all electric cables up to 66 KV will be underground. The investor community is seeing the area around Dwarka Expressway as a serious investment opportunity. Early investments have shown excellent growth; and with the Expressway heading towards completion, investor interest is very positive. Clearly, Dwarka Expressway is the most affordable, and it also offers the best investment opportunity at this time.